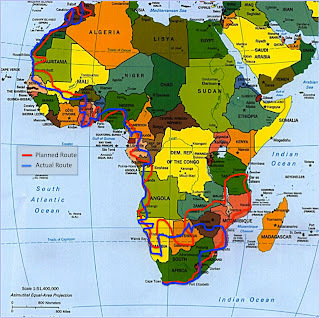 This is travel diary for our 12 month trip from UK to South Africa via Europe and Western Africa. We started May 2010 and finished the May 2011. We covered 48,361km in our 4x4 Land Rover Defender 110, visited 30+ countries and performed a variety of photographic studies along the way. All content & photos are subject to Copyright. Please contact author for re-use rights. Hi folks, after a busy few years here in SA we are now selling Dassie our overland ready Land Rover Defender 110 300 TDi Hard Top. We had a great trip across Europe & Africa in 2010/11 and have added many new things to the vehicle but we are now making a few life changes and starting a new challenge, so want to pass her onto a new owner for a new adventure. 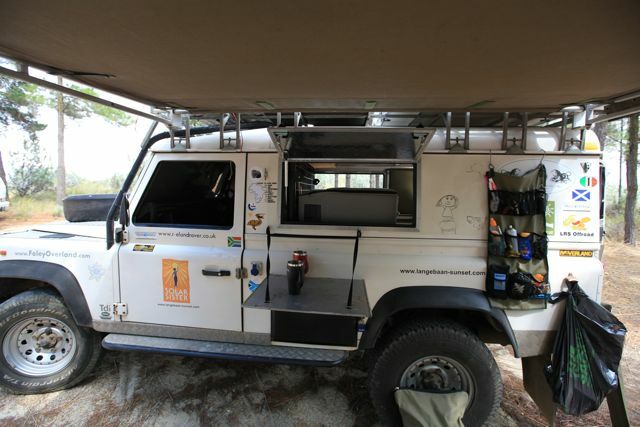 The base vehicle is a 1997 Defender 100 300TDI Hard Top van with heavy duty Salisbury rear axle & R380 gear box. It was a former Environment Agency vehicle and was well looked after. 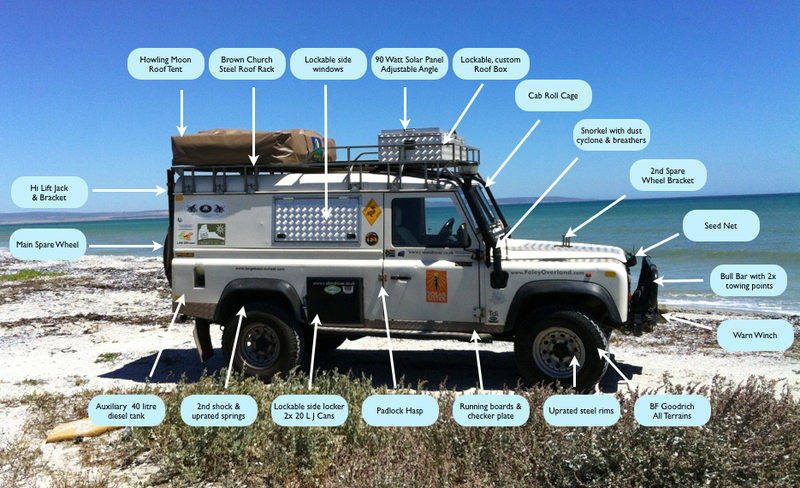 She had all major works (including cab roll cage) performed by Foley Overland UK with some subsequent additions by Burnco of Cape Town. On our trip she performed amazingly well and is in top class condition and been serviced regularly. She is currently on an SA plate but we also have the original UK paperwork / plates, so import back to UK would be very easy as she is SORN with DVLA. 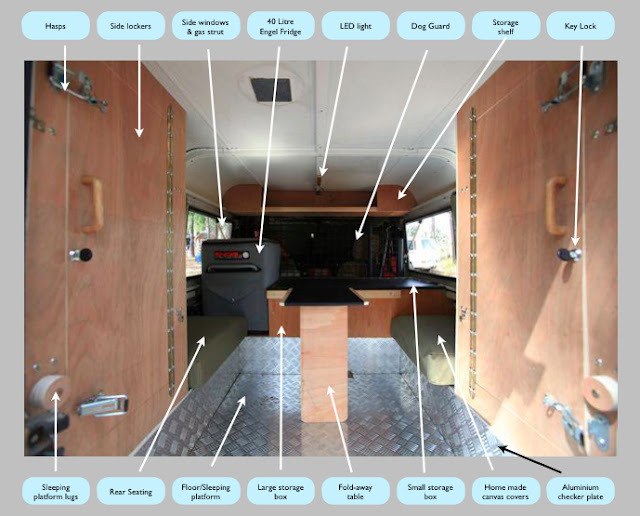 We enhanced the rear of the vehicle after the trip to serve as place to sit when cold / wet or needing some privacy and you can convert for emergency sleeping when in cities as the rear floor turns into a sleeping area in really bad weather. The new side windows give a real feeling of the space being with a cool breeze that makes the interior a nice place to sit. A small fold out table is big enough to prep meals and use a laptop but small enough to pack away when needed. Been very quite for 1 year - sorry about that. Got the Blog mojo back and thought we would post some pics of some of the things we have done to Dassie the Land Rover. We are going to add some more pics to this post shortly, but the key items are shown in the images below. The main focus has been on the interior re-wiring and solar system as well as some basic tidy up jobs to sort things that broke or wore out on the trip through Africa. Base vehicle is 300 TDi 110 Hard Top Defender 2 seats front plus 2x side seats rear. Rear is designed to serve as place to sit when cold / wet / privacy AND convert into bed for emergency sleeping when in cities or for emergencies / bad weather. 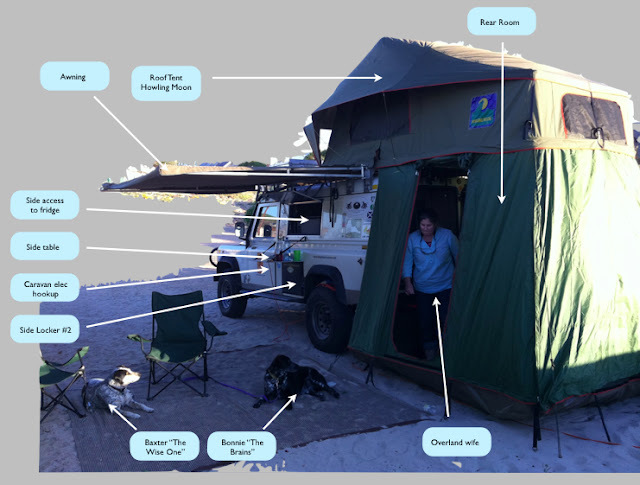 We did this because we found that we liked the compact foot-print of a Land Rover but sometimes wanted some privacy and shelter from the elements - its not always hot and dry! Although during most of our trip we were warm, there were times in the mountains, high winds and storms where you just want to sit inside and eat, talk and escape curious people. The Land Rover has a strange comforting smell (to us it does) and whilst space is of a premium, the cosy nature of the rear compartment is now something we really enjoy. The side windows do give a real feeling of the space being bigger than it is, with a cool breeze that makes the interior a nice place to sit. A small fold out table is big enough to prep meals and use a laptop but small enough to pack away when needed. The floor is removable and we can attach it to the storage box to make a sleeping platform. Its not exactly spacious, but it gives us the compromise of a useful seating area, storage, place to work on the laptop / plan and sleep if needed. We had to modify the dog guard so we can crawl in, but its cosy and will do as a compromise. Vicks made some nice seat covers and I added the checker plate. Actually the word compromise is the most often word used when preparing for an overland vehicle / trip.....get used to it! Well - after 48,361km and now having proper tools, a garage and some spare time, Nick set about doing modifications to Dassie to make her into the 4x4 we wished we had when we started but why make the changes and what did we do......?? We are still tweaking things but the basics of Dassie 2.0 are now complete and we just need to iron out a few more issues. A recent shakedown trip has shown that most of the changes work well. 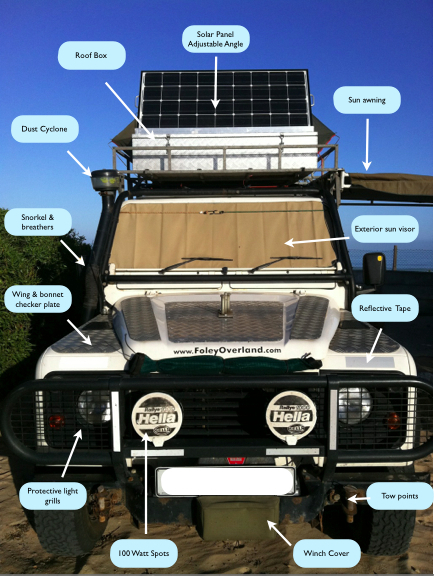 The final jobs are now focused on finishing the water system and fixing the solar panel to the roof box on a frame that will allow us to remove it and place it in the sun when we are parked in the shade. If you want to make contact with Burnco, the people that did an AMAZING job on our side windows and fabricated our aluminium storage box, their contact details are below. They did a great job for us, on time, offered honest advice and were very competitive on price. They really know about 4x4 / overland prep and if you were shipping your car to SA to do Cape Town to London or have just finished your trip and need some work doing, I would really recommend you make contact with them for any bespoke modifications. Happy to take questions on your own build. One of the main questions that came back from our London to Cape Town in 10 minutes film was "Its a bit flat", "that's easy" and "where's all the hard roads we thought existed in Africa". 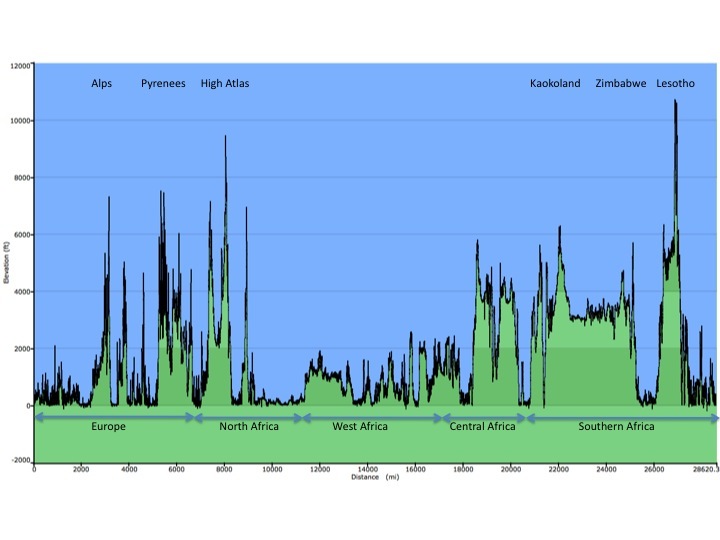 Well, to help develop that thread and answer those questions, we pulled nearly half a million track points off our Garmin database and analyzed the altitude information "You Geek!" I hear you say..... well, yes, to a point but the resulting information highlighted that we went up and down a LOT on our 48,361km drive South and perhaps a little more that we had realized. The chart below shows the data in more detail. As you can see, its pretty spiky!!! 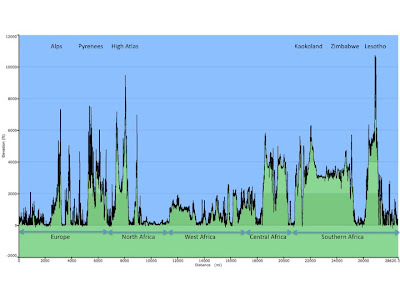 We have added some indicators to key regions and key countries with Lesotho being the highest we reached at circa 10,600 feet. Not quite Everest but certainly a challenge. As part of a look back at our Africa Overland trip, we compiled a 10 minute film that offers an insight into the road conditions you are going to face if you travel the West Coast / Central African route towards South Africa. From the deserts of North Africa and the lush greens of West Africa to the mud of Cameroon and rain forest of Gabon, this video has the lot. We did a fair bit of off-road driving as well as main roads so the video has a mix of road types for you to see. We hope you enjoy it as much as we did driving it! In the meantime, check out our summary Top 10 lists you might want to consider - we would love to hear more Tops 10's from other people. What were the top 10 most useful items you took? The COBB - Great for slow cooking, bulk food, BBQ, roasting & making pizzas! What were the top 10 least useful items you took? Two way radios - only useful if other people know how to use them & switch them on! What were the top 10 things you would do differently next time? Have improved storage in vehicle - we rushed our system / it self destructed! Sit inside / sleep in vehicle - It does get cold in Africa, good to be able to keep warm, get out of rain / damp. Its also nice to have some privacy sometimes. Make sure its easy to get to fridge !! Try not to pack things in too many boxes - they take up space. Lockers are better. 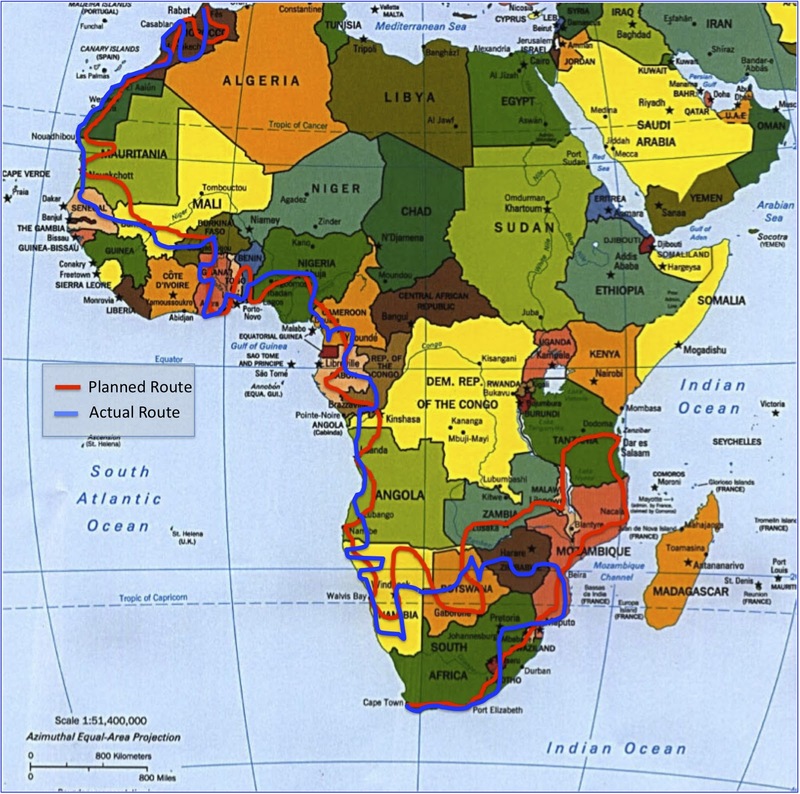 Hi folks, if you are reading this, you are either about to embark on an overland trip, taking part in one or just about to complete one. Either way, if you are a returning South African (like my wife) we want to share our experience of importing our Land Rover duty free into SA after our London to Cape Town trip 2010/11. This process is likely to be the same for a motorbike or truck traveling on a Carnet but as rules change, this is now possibly out of date. We offer the following is a summary / check list for any returning South African citizen that has a foreign registered vehicle and wishes to import it into SA free of duty. There are several things that you need to consider BEFORE you set out as there are some items that need to be addressed in your departing country before you set out on your journey if you want to avoid a lot of hassle when you get here. Even though there are various guidelines available on this process, things "on the ground" are often different and even our clearing agent in Cape Town had to jump through a few hoops. MOST IMPORTANT FOR THIS SCENARIO: The car has to have been registered in the SA citizens name for at least 12 months prior to returning to SA, so make sure the registration papers reflect this. Other import scenarios may have different rules and rules change! - Original SA Passport (or IF dual citizenship, foreign passport) of returning SA citizen should clearly state departure and arrival times stamped in the passport of when you came into country and when you left SA – THIS IS KEY! - Even if the entry date is on an old passport – bring the old passport with you otherwise you will have to produce an authorised affidavit to cover any discrepancy. - Letter confirming employment by foreign employer – this has to be an original and signed / dated. Copies will not be accepted. Get at least 2 signed originals just in case your paperwork gets lost in the system! - Carnet – You will / should have this for your journey anyway. For those people that hope / plan to travel and get into SA with a fake Carnet – good luck!! Based on the process we went through it would be HIGHLY unadvisable to try this!! At port of entry you only need to get the Carnet stamped into SA when you finally get here (i.e. the entry stub stamped) – same process for all the other countries you visited along the way. You do not need to fill in any forms at the border with regards the car import process. We even asked about this at the time and they simply refused to discuss it saying the Carnet “entry” stamp was all that was needed. There will then be the possibility that you will need a Customs Exam of the Car, this is at Customs discretion AFTER perusal of your Carnet. Even if you are told that this is required, it maybe cancelled at the last minute. We did not have to have one in the end. A provisional payment may also be requested as surety for the duties and vat applicable, again at customs discretion so be prepared for this. You are aiming to get your Carnet exit stub stamped by SARS – this is key if you are to discharge the Carnet and get your Bank Guarantee / Security Insurance / Deposit cancelled. You are now able to go and register the vehicle in SA. We posted the Carnet back to RAC UK and emailed copies of the SARS release form (we made a copy for our records). So how did we do it / what did it cost? 1) You are going to spend a lot of time waiting and finding offices etc….. The benefit of using an agent is they already have established relationships with all the people needed to get the car released, they know the process / forms and they can minimise the amount of time and cost spent driving / calling around to various offices to chase paperwork etc….This is important if you have limited time or are spending time travelling elsewhere when you get here. We used Ashraf at IQSA and he was VERY helpful and professional. Whilst there is a fee associated with the service, we felt it was worth paying. We saved a lot of time & money simply on fuel costs for driving in and out of Cape Town to various places to get things sorted. We would highly recommend him! !